I don't really like first-person-shooter games, but Toy Trouble by Brainsmash Interactive is the exception. It has both single player and mutiplayer capability (both network and split screen), different play modes for the single player, different weapons, and above all, it is a very unique twist on the very old idea of a FPS. 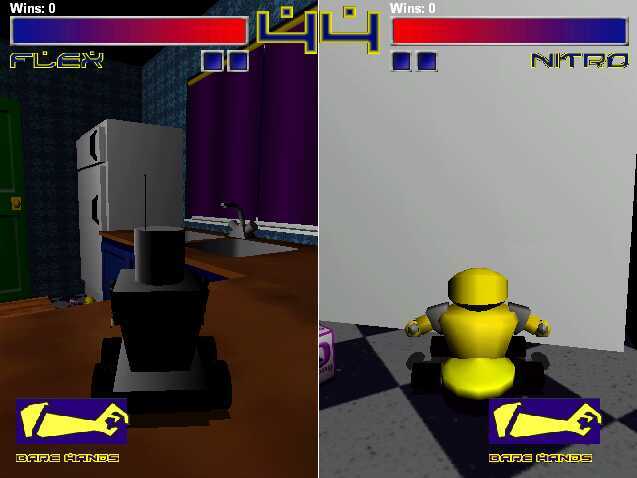 The idea behind the game is that you are a toy robot, and you fight against another toy robot. It is a simple idea, but it's a genius twist. 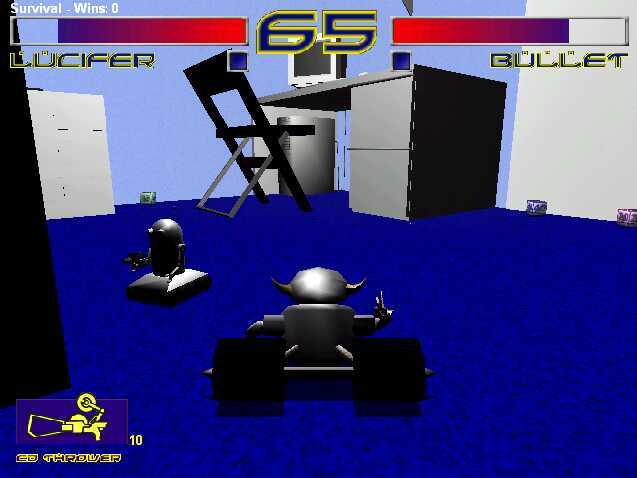 It's like a game version of the TV show Robot Wars, but it takes place inside of a house. You start off in the kitchen, then progress through bed rooms, the living room, the garage, and more. You can find power ups in the kitchen sink, under beds, and scattered throughout the house. The game ships without music, but there is a music add-on you can download, which I haven't tried yet. The game does require a 3D video card, and on my ATI Rage Pro 8 MB video card, the game was slow on some levels, so I recommend at least something as fast or faster as a voodoo3. The only complaints I have is that the collision detection isn't perfect and the camera jumps around sometimes. My robot got stuck in the arm of a chair, and the time ran out, so I lost that match. The camera sometimes goes crazy when in tight spots, like under a bed or or when jumping and getting stuck because of collision problems. Those little problems are just me being picky. The game, overall, is wonderfull. It's a new perspective on the relatively unchanged FPS game concept that has been around since 80386 processors. Toy robots are fun, especially when you get to controll them around the house attacking other toy robots. Tip: The Tab button displays the FPS.